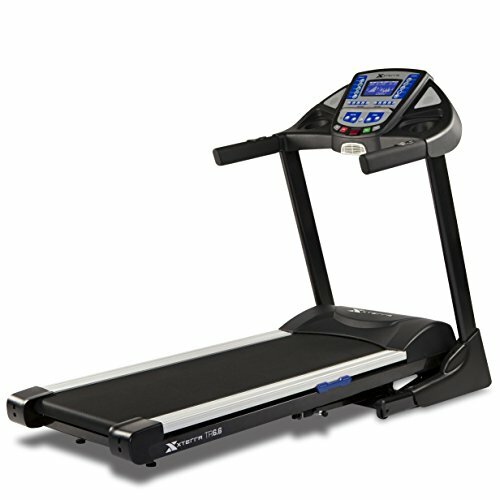 First in Class is the XTERRA TR6.6 Treadmill! Whether you are preparing for the XTERRA Trail Run Nationals in Utah or taking a leisurely stroll on the largest, most powerful engineered XTERRA Treadmill, the TR6.6 is your answer. The comfort of walking or running on the cushioned 20” x 60” treadmill deck will allow you to achieve your health & fitness goals. State-of-the-art electronics are featured in the easy to read, 7.5” Bright Blue Backlit LCD display along with speed and elevation handlebar controls that allow you to easily and safely make adjustments without losing your stride. Remain encouraged on your road to achieving your goals on this high performance and stylish XTERRA treadmill! 7 preset, manual, 2 user & 2 heart rate controlled programs offer variety for your workouts. Assembled dimensions – L x W x H: 78.9" x 35" x 57.1"